If people want games that they can play for dozens of hours, why did only 10% of purchasers complete Joe Danger? The encroachment of the internet into consoles has enabled us to do more than compete online. It also allows developers to "see" how gamers are playing and how much of their games are being completed. In the case of Hello Games' Joe Danger the majority of its audience didn't complete the game at all, calling into question whether people actually want long games anymore or not. The complaint of games being "too short" is brought up often, as Hello Games' Sean Murray points out in a post on Edge, with developers and journalists alike often arguing over whether this is a valid complaint. Joe Danger got strong reviews and had strong sales to go along with them (selling 50,000 in its first week alone and recouping development costs on its first day), and even in my brief hands-on at PAX East I was able to tell that it was a deep game. But if everybody cares about game length, and people hate short games, why did only 10% of purchasers complete Joe Danger as Murray reveals in his post? "Only about 10 per cent of people who bought Joe Danger have completed it (their average play time is well over 20 hours)," he writes. "Most journalists didn't get past the halfway mark." So he wonders: "Was it a wasted effort to add those last few levels that most people don't see though? Is it valueless?" Murray says no, admitting that he aspires to "creating something so lasting and varied," and I agree. People can plop down Portal as an example of a great "short" game and I'll agree that games can be short and great too, but there is a huge amount of value in deeper experiences like Joe Danger, not only because of the amount of content, but because they're a different kind of gaming experience. Murray calls the 10% his most "valued players," but he could be counting out the type of players like myself. I can play games like Tony Hawk and Stuntman for hours trying to nail a perfect run or to squeeze out a few more points. 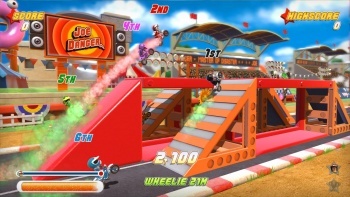 Joe Danger is a similar kind of experience, sort of like an individual level-based sandbox that gives players freedom within an enclosed gaming space that will be different each time they play. I might not beat games like Joe Danger all the time, but I'll definitely get my money's worth out of whatever levels I play and enjoy it every second of the way. It's not always the completion of the game that matters, but the fact that I know the content is there will get me to plunk down my $14.99, which I'll also gladly plunk down for a shorter game that's completely different. A good game is not always about length, but about doing something unique well.